Remember how I worried about the bridge collapsing beneath me in the last post? Well, this is a picture of that bridge, the Rialto Bridge. It turns out I’m not the first person to worry about the stability of the bridge. March 2014, panorama from 2 horizontal images, additional exposures for highlights, focal length 16mm, aperture f/14, shutter speed 3.2 seconds, ISO 100, tripod. Although it may not look like it – this was a groundbreaking design for a bridge when it was built back in the 16th century. It is called a single span bridge, meaning it is anchored on two sides with no support in the middle. Many thought it would not last with this crazy architectural technique yet here it still stands nearly 500 years later! 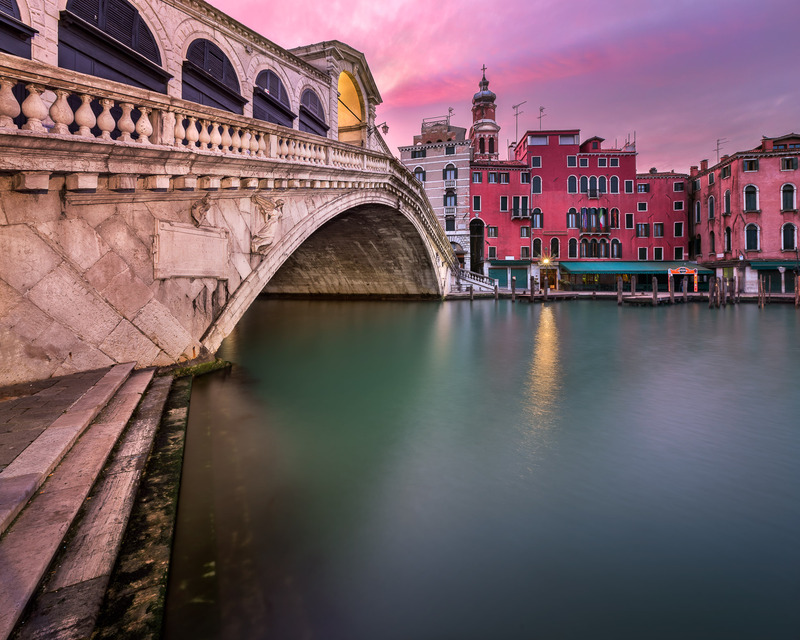 You may recognize this scene in the photo; it is one of the most famous places in Venice. Getting into the spirit of the innovative architecture of the Rialto Bridge, I wanted to find my unique angle. I decided to spend entire morning at Rialto Bridge alone to find some fresh composition. The sky was cooperative this morning with the clouds partially covering the rising sun and promising a spectacular light. As time passed the sky soon began to glow red. I chose a vertical panorama composition using two horizontal frames. One frame featured the sky and the background with the San Bartolomeo Church, the second frame featured the water and steps in the foreground. I believe this composition is strong due to prominent leading lines from the steps to the bridge along with the church in the background. I am happy with the result of finding a unique composition for this a much-photographed location and my luck with spectacular light this morning!